As you may have noticed, I’ve been doing a lot of thinking lately about ‘the wrongs of rights‘, and why I think they’re seriously problematic at every scale of an enterprise-architecture. 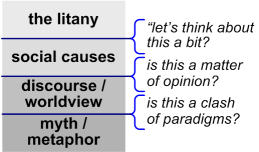 The way that CLA works in practice is indicated by the paper’s subtitle, ’poststructuralism as method’: we apply academic-style ‘deconstruction’ (from linguistic-analysis etc) at each those four layers, or four ‘ways of knowing’, moving up and down the layers to elicit more information and experiences about and views on the overall context. Which is kind of interesting. And which suggests a whole stream of other potentially-useful crossmaps. This crossmap also conflicts quite a bit with the standard Cynefin description of the Chaotic domain that kind-of implies the Chaotic is somewhere we’d usually need to get away from as quickly as possible. The CLA mapping here suggests instead that the Chaotic is a valid and important domain in its own right – somewhere that might well be challenging at a deep personal level, but also where we might want to stay and explore for a while, until the depths get a bit too much and we need to come back elsewhere for air. But notice that in context-space mapping, that kind of apparent-conflict is perfectly okay: both views are ‘true’, the concern is more about which view is useful for a given purpose. Which is interesting in itself – for me, at least, because it brings up more ideas about how and where and in what contexts to use CLA, and when to switch between the different types of deconstruction that apply in the respective CLA layers. What this also suggests is that when a culture is under stress, it will automatically tend towards this kind of ‘Two Cultures’ dichotomy between ‘Truth’ (Simple) versus ‘Value’ (Chaotic) – which, yes, is a dichotomy that itself often becomes over-Simple. The ‘Truth’-meme will tend to dismiss anything ‘not-True’ as ‘anarchic’, but its inherently constrained set of categories will, almost by definition, never be sufficient to deal with inherent-uncertainty: hence the kind of ‘collapse into chaos’ described in the Cynefin model. On the other side, the ‘Value’-meme is – again almost by definition – seemingly unlikely to generate any kind of stable categorisation via which a Simple-domain mode can make sense. What we see in practice is that as the social stress increases and the links between people fragment, those Simple categories of shared ‘inner-truths’ – “what is True for we” – tend to separate out into self-specific ‘inner-truths’ – “what is True for me‘. This also leads a loss of awareness of the necessary mutuality of responsibilities that underpins all social constructs such as ‘rights’, such that ‘our rights’ becomes reframed solely in terms of ‘my rights’: “we hold these truths to be self-evident” morphs into a self-centred demand to the Other to “hold my truths to be self-evident”, and so on. And without shared-categories, any social structure based on a Simple ‘sense / categorise / respond’ will by definition start to break down. The usual result is a spiralling descent into an out-of-control litany of complaint, first to ‘What’s in it for me?’, then ‘Me first!’, to a fully self-centred ‘Me-only!’, and eventually a truly chaotic cacophony of ’Me! Me! Me!’ – otherwise known as ‘kiddies’-anarchy’. In a very literal sense, the Simple inherently becomes chaotic. And there doesn’t seem to be any direct ‘truth’-based path back from there, other than via some forceful imposition of rule and rules: either the ‘dictator’s gambit’ or, in rarer cases, the ‘Truth of the Prophet’. 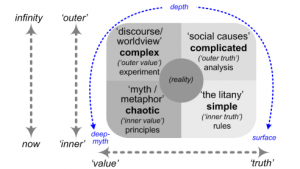 Yet from the opposite side of the ‘truth/value’ dichotomy, what does seem to work is a re-focus on ‘inner-value’, on deep-principles and, especially, deep-myth. It has a surface appearance of the Chaotic, but actually develops its own simplicity: a functional and, often, highly-disciplined form of anarchy, rather than a dysfunctional one. Given that sensemaking/decision-making pattern of ‘act / sense / respond’, the very act of expression often means that whatever arises automatically takes on a social form. Again, from practical experience, these context-specific images seem to act as ‘seeds’ around which directed action can coalesce – much as would happen in a more usual move into the Complex-domain, except that the time-pressures or social-context pressures mean that it actually remains within the ‘pressure-cooker’ of the Chaotic. 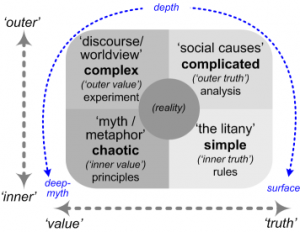 The more that the focus can be held in this mode of the Chaotic-domain, te more ideas can be created – and the more the emphasis is held on the decision-making guides of the respective principles and values, the more likely it is that these ideas and images will be experienced as ‘of value’ within that context. The ways in which directed-action can coalesce around these ‘seeds’ can sometimes – perhaps often – lead to enough of a structure to enable a Simple-type ‘sense / categorise / respond’ mode of decisionmaking: in other words, something that is more generally actionable than a highly-personal ‘inner-value’. Which, in turn, can provide enough of an anchor for a more balanced and principles-guided way out of the crisis – a ‘values‘-based way back to ‘truth’. To summarise this in much shorter form, what this suggests is that the key people in a major social crisis are the artists and the storytellers. The military-commanders and managers and the priests – the ‘truth-holders’ who maintain order – may come to the fore before the collapse, or after the recovery has started: but in the midst of the crisis it is those who normally live close to Chaos to whom the baton must be passed. In effect, this is a method to define a governance-process for use in contexts where a conventional rule-based approach to governance will naturally break down – an interesting architectural recursion! Anyway, enough for now: over to you for comments/suggestions etc?